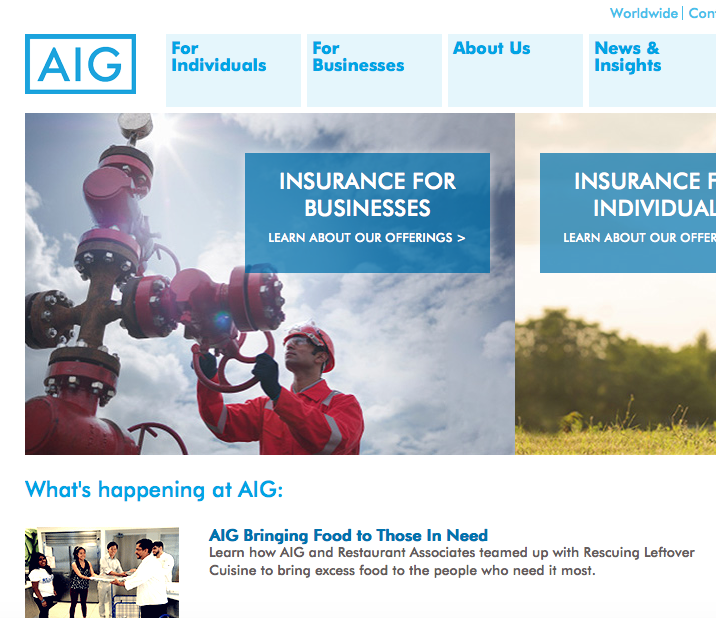 AIG, American International Group (www.aig.com) is an American multinational insurance company for commercial, institutional and personal use. With over 65,000 employees in 90 countries AIG is publicly traded on the NYSE:AIG. There are 88 million customers located in over 130 countries. Operating income was reported as US 10.5 billion in 2014. If you need to contact AIG corporate office, you may call 212-770-7000 for claims or 212-770-7072 for data. You may also submit an email here. If you would like to contact CEO, Peter Hancock, you may address postal correspondence to 70 Pine Street, 180 Maiden Lane, New York, NY 10038. AIG was founded in 1919 In Shanghai, China. After opening branches in SE Asia and Latin America founder Cornelius Vander Starr moved AIG headquarters to New York City. An interesting history of the company may be found here. Social media presence may be found on Facebook, Twitter, Linkedin, Google+ and YouTube. Had tax issue with the IRS before we book our trip to Shreveport La, we under the impression from the tax professional that we hire that the issue would be resolved in a couple of months. Be due to the government shutdown are case has not be settle yet. So we were force to cancel our trip due to fact that we don't know how much of the taxes levy against us we may have to pay. File a claim with AGI and the claim was denied, so now we are out of 300 some dollars. Maybe that my seem like nothing to a big company like AGI but to working people like us it quite a bit of money. Thanks for nothing AGI, will never use you company again. 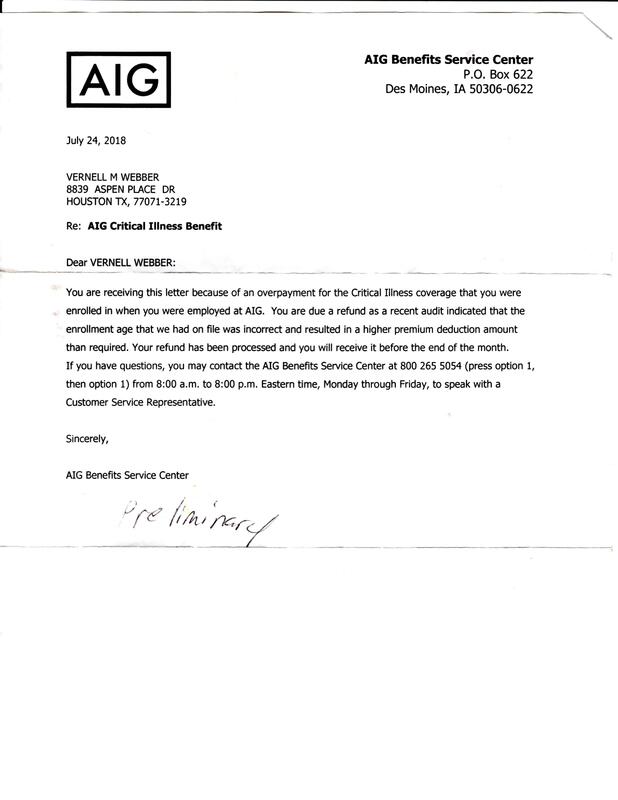 I received a letter dated July 24, 2018 indicated an overpayment for Critical Illness coverage during my enrollment. It stated a refund as a recent audit was due as a result of the high premium. I called in August and I spoke to your representative and they were unable to provide a date of the funds to be sent to me. I called In September an they would look into and give me a callback. Well, I never received a call and I call in October spoke with a supervisor and he had no answer and he would return my call. Again, I never received a call, so I call in November and spoke with a supervisor and he indicated the check was placed in my account. I asked what account you have no knowledge of where I bank, he couldn't provide me the information and stated he would look into it and get back to me. I still haven't received any follow up to my concern/issue. This is simply the worst customer service I every received and I'm really considering cancelling my other business with you because of this issue. I called on 01/24/2019 and spent over an 1 hour and was given the run around and transferred to other department until I decided to forward a complaint to your company. I'm really considering putting this on social media to alert others who may consider doing business with your company. I'm looking for someone to look into this matter for immediate resolution. I am a disabled Veteran whom (during the month of April, had undergone a culmination of back surgery and fusion procedures. When purchasing my tickets, I purchased the insurance policy in the case that the complication would prevent me from attending my Mother's 75th Birthday in November. Lo and behold, while being under consult for surgical problems with the Neurology Department at the VA Medical Center in Portland, Oregon, was totally contradictory from the lists of medical conditions listed on the online AIG complaint form. To put it colloquially, "There was not a listing for surgery let alone surgical complications, so I had to put it under the umbrella of sickness. To make matters worse, I received an email from a worker who for whatever reason can seem to answer nor respond to phone messages. Yet, this worker can quickly respond in the most impersonal way--electronically. Because I am a Disabled Veteran undergoing complications, I am neither working nor do I live beyond my means. I really believed that by purchasing the "travel guard policy" people would honor as well as do right by me the consumer. Obviously, I held your company to a level that is both unwarranted and not to mention unrealistic. To be quite honest, the overall experience of dealing with your quickly espoused "policies" as well as Ms. Valdez, agent handling my claim was as equally dubious as it was dishonest and disconcerting. So, for someone who has undergone 20 major surgeries within a short time span, the price of the nonrefundable ticket does come at a heavy cost. If there is a person, (and yes that too goes to the CEO of the company) who is actually willing to rise up and perform both the righteous and honorable solutions; than without holding my breathe, I do hereby welcome it. Thank you for your time in reading my complain Mr. CEO. I tried to cancel a life insurance annuity policy 2 days after the agent came to my house and suckered me into getting it. I tried checking online but there was no record of the policy. I called the agent to cancel the policy. He said to wait until I received the policy in the mail then call and cancel. I waited 2 weeks for the information in the mail. I called the day it was received. Again, there was a lot of web searching before anyone could find the policy. I was then told to contact the agent that sold the policy in order to have it canceled. I told the representative on the phone that I already spoke to the agent and he said I should call the number listed in the policy. I called the agent again, the day after calling the company. He said that there should be no reason that I should have to call him. Approximately 2 weeks later, I received a letter in the mail from a third company, not AIG, stating that my policy was considered canceled. On 7 December 2018, a policy premium was automatically drafted from my checking account. I called AIG again and after being transferred to a few people, I told the person on the phone that I did not want the minimum coverage policy at the maximum price that AIG is charging. I have another policy that is 4 times the coverage for two-thirds the premium price. It would be ridiculous to cancel the larger policy for the smaller one. I informed the person on the phone that I called previously to have the policy canceled. However, someone apparently did not remove the automatic draft for the policy. So here I am with an insurance policy that cost an excessive amount of money a month that I didn't want. I wanted my premium refunded. The person on the phone said that I should get a check in about 3-10 business days. That means that I will be short money until after the New Year since 3-10 business days is actually going to be about 15 business days before someone actually gets around to cutting the check and sending it in the mail. Ten days is Christmas Eve. I'm really not holding my breathe to see the check before or on that day. Each time I have called, the customer service has been difficult to talk with due to the non-English accents that all the representatives on the phone have. I have to practically phonetically spell my name, street address, city, etc. I have since learned that the business headquarters is in New York but the company was founded in China of all places. I should have known that something called American International Group would not be in America. Now someone in China has my social security number and my money. If I do not get my money back by mid-January, or if you clowns decide to autodraft my account again, or perhaps start sending me delinquent account hate-mail, I'll be forced to file a complaint with the Federal and State Insurance boards, or whomever holds companies like your accountable for scamming the public! AIG claim# 7208898373CA. Insured policy# RMBA14047813. I was involved in an accident caused by an 18 wheeler insured by AIG. I have been given the run around. Unanswered voice mails, emails not responded to and bounced from 1 person to another and nobody knows anything. Looking at reviews online this seems to be standard operating procedure. This has been going on for 2 months now and would like to get it resolved. AIGs international presence has attracted over 88 million customers world wide in over 100 countries. But their customer service still needs work! I wanted to sign up for a policy with AIG but the website was not working for me while traveling in business to India. One of the leading insurance organizations, they have always brought in different products that have always proven to be trustworthy and carry dedication to their customers. But when I had a problem recently, I wrote a formal complaint letter to the headquarters in Hong Kong. If you are curious, the address is AIG Insurance Hong Kong Limited 46/F, One Island East, 18 Westlands Road, Island East, Hong Kong. When that failed miserably, I tried the contact number listed for international and USA on the website +852 3555 0000. AIG should be held responsible as they have various insurance coverages like travel Insurance, domestic worker protection, Working holiday insurance, and golf insurance. Next time I am upset with my policy, I am going to escalate this to the CEO, Peter D. Hancock. I have an AIG insurance policy that payment is due quarterly. I opted not to have message sent to me by e mail regarding my payments. I have asked for a paper billing quarterly to be sent to my address. All phone calls said they would send out in a week. It is now a month on the 3rd call for this payment due Feb 14. Who can get action on this if not corporate? Has anyone found a good way to file a complaint online against AIG and get satisfaction? My insurance policy number ommaoo5568. I submitted check to company address and no response. I want a response but mail please. I don't use email anymore. Looking for an answer. I have cancelled my vehicle insurance with AIG in Dubai, UAE. I was supposed to receive my refund back within one week as per their customer service, which they have stated on an email. It has been a month for now, and I have not received the refund from the corporate offices. They do not reply to my emails anymore either. They do not answer my calls to support. It is the worst customer experience that has ever happened to me since in moved to Dubai six years ago, and I hope that people understand what type of company this is. If you happen to have the claims department address I would appreciate it. After hours of searching on their website www.aig.com I have not yet found a number that has a human answering on the other line. There are only robots and long waits. Sometimes expect the unexpected in terms of accidents and we would definitely look out for an insurance that could cover this. AIG helps provide such insurance coverage.I opted for AIG as they also cover Life Insurance, retirement plans, accidental and health insurance and have some great plans on mutual funds. The customer care at AIG have provided me complete details on which insurance coverage is the best for me and my family and I have got a clear understanding on the policies.